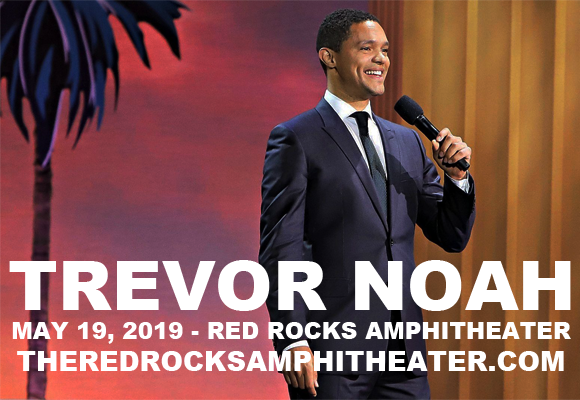 Trevor Noah comes to Red Rocks Amphitheater on Sunday 19th May 2019 as part of his highly anticipated debut amphitheater tour, Loud & Clear! The all-new stand-up show sees the seemingly untouchable host of The Daily Show delivering his trademark satirical blows with full punch, getting some guaranteed belly laughs! Clever, quick and deliciously funny, Noah is a must-see live act at his zenith! South African comedian, writer, producer, political commentator, actor, and current host of The Daily Show Trevor Noah's rise to fame began in the early 2000s. Hailing from Johannesburg, Noah hosted the South African educational TV programme Run The Adventure from 2004 – 2006 and regularly toured the country as a stand-up comedian. He hosted a variety of popular television programs and awards ceremonies throughout the 2000s and in 2008 he was a contestant on fourth season of Strictly Come Dancing, raising his profile further. He was the creator and host of Tonight with Trevor Noah on M-Net and DStv from 2010 – 2011, and also recorded four stand-up comedy specials in South Africa: The Daywalker (2009), Crazy Normal (2011), That's Racist (2012), and It's My Culture (2013). Upon relocating to the United States in 2011, Noah became the first South African stand-up comedian to appear on The Tonight Show and on the Late Show with David Letterman. This was the beginning of international success for him, as he was invited to appear on several other American talk shows, English panel shows and at various international comedy festivals. Noah has released five comedy specials in the US and in 2014 he became the Senior International Correspondent for The Daily Show, where he is set to remain as host until 2022. His autobiographical comedy book Born a Crime (2016) became a #1 New York Times Bestseller and was named one of the best books of the year by The New York Times, Newsday, Esquire, NPR, and Booklist. The book will be adapted into a film, which will be co-produced by Lupita Nyongo, who will also star as Trevor's mother. In 2018 he was named by Time magazine as one of the 100 most influential people in the world.